Parental gifts to teachers have become increasingly expensive in recent years, with tales of exorbitant gifts on the rise: Tiffany bracelets, a Mulberry handbag, £200 of opera house vouchers and gift vouchers worth £1000 were reported in the Independent, 17 July, 2014. Many of us will have witnessed mothers tottering in the school gate, weighed down with their luxury, high-end gift bags; leaving others to feel they need to shuffle through the door with their box of biscuits, or bunch of flowers from the market, or their garden. Apparently the phenomena is becoming so commonplace in some schools, that they have had to introduce rules to cap the value of presents that teachers can accept. Going back to our imagined Miss Smith, I wonder how she feels unwrapping her high-end gift set? Is she delighted, or embarrassed, at the indulgent gift? Grubby fingers and runny-nose-worries aside, do the homemade biscuits mean more to her – due to the thought and time that has gone into them – or now that expensive gifts are on the rise, are homemade ones quickly discarded? And what drives the parents to spend so extravagantly? Is it a case of keeping up with the Joneses, is it a demonstrative show of wealth, are they trying to curry favour with the teacher (and if so, does it ever work? ), or is it simply a kind thank you for an exceptional and demanding job? Should the expensive-gift-givers stop to wonder how it makes the other parents, or teachers, or children feel; or would they even care? One friend, who has four children, pointed out that with multiple children there comes multiple teachers and teaching assistants to buy for: in her case a minimum of eight presents! It adds up to a small fortune…to say thank you to someone who has simply done the job they are paid to do. This made me wonder; is it any different to the corporate sector? Where some people might receive a bottle of wine, or champagne, to say thank you for a job well-done: some expensive, some not. There is one major difference though: the audience! Teachers might be opening gifts of varying value in front of small, eager and expectant faces. Maybe the schools who cap a value on gifts have the right idea and maybe parents should consider the impact on other children that their extravagance might have. After all, this endemic could reach ridiculous proportions if parents increasingly feel the need to compete through gifts! How do the children feel: are they embarrased handing over their homemade gift; if it is later trumped by someone’s surplus spending, or do they even notice? Maybe they are proud that they have put time and effort into their gift, as opposed to just handing over their parents spending power? Little children are less likely to realise, or even consider, a gift’s value: it was only recently that my youngest asked for a packet of jellybeans for Christmas. But as they get older, there’s potentially more chance for embarrassment, or snide comments! The best present I ever received, which still brings tears to my eyes, was a half-eaten biscuit wrapped up in a sheet of loo roll! The little boy came from a family who had very little and he was desperate to give me something, like his friends; so he only ate half his break-time biscuit and gave me the rest. We shared his present because it was such a kind thought. Ooh, I’ve only ever seen these in cardboard boxes before, this looks very posh! So what do you think? 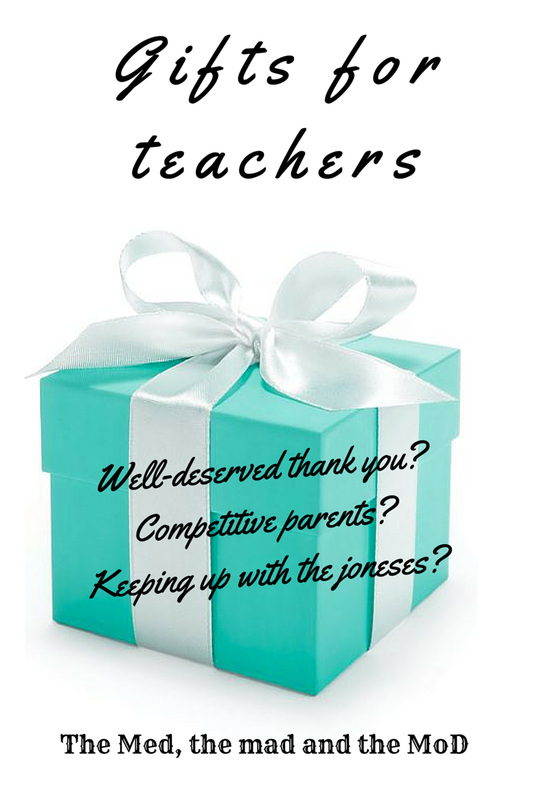 Do you feel pressure, as a parent, in deciding what to buy for a teacher? Do you feel you need to spend more to keep up with this trend? As a pupil, do you feel embarrassed, or proud, handing over a homemade gift, as opposed to an expensive shop-bought gift? And if you are a teacher, do you wish each school would set a cap on how much should be spent on gifts, or do you think that might exacerbate the spending further?